Since Asia-Art-Activism moved into Raven Row, it has become a meeting place for artists, curators and researchers whose work relates and responds to the cartographies and communities of “Asia” including Southeast Asia and East Asia. Many of our associates and friends also identify as part of a wider global Asian diaspora community, that is itself diverse with links across the vast continents. Through many conversations over the months, some with visitors and friends hailing from across the globe, we find relatable connections and comparable contexts in relation to how we live in our daily lives; how we eat, how we communicate, and what we do. 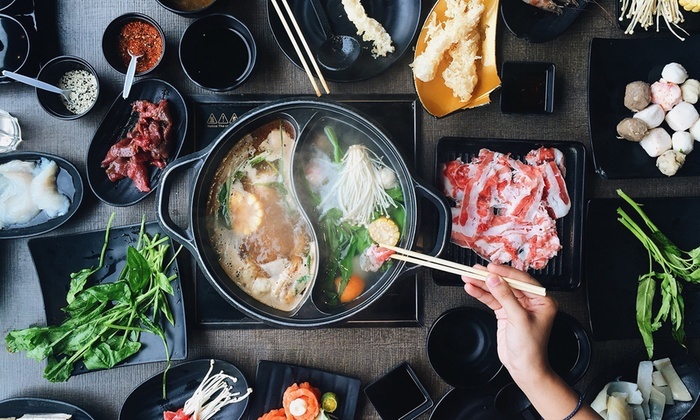 This chilly February, warm-up with us over food, music and reflections event, where we discuss with our special guests how the term “Asia Pacific” fuses two large and complex regions of the world into a single identity, for better or worse. In some cases, intertwining groups and subgroups can be an instrument of coalition, while it other cases it can lead to harmful generalizations and marginalization. How has “Asia Pacific” extended beyond a geographic imagination with the rise of travel, migration, and online communication, and what roles do those of the diaspora play in both the preservation and diluting of culture? Food and music can be indexical and evocative of places and memories. How food is made and eaten, speaks also of systemic practices and histories. Music speaks of historical flows and exchanges across popular culture. This afternoon, we’ll share and commune over a hot-pot-luck. – If you wish to share a playlist or a poem that is relevant – please do! Please note – this event is also BYOB. Annie Jael Kwan is an independent curator and reseacher based in London. Her interests are focused on the contemporary and live art of Southeast Asia and diaspora connections globally. Since 2012, with her curatorial initiative, Something Human, she has been researching and curating projects that explore issues of movement across borders, migration and identities, while raising the visibility of Southeast Asian/Asian artists in the UK and Europe. In 2017, Something Human initiated and launched the Southeast Asian Performance Collection, an archive of performance materials that are accessible to researchers at the library of the Live Art Development Agency. She is a founding member of Asia-Art-Activism. Adriel Luis is a community organizer, artist, and curator who believes that our collective imagination can make a reality where we all thrive. His life’s work is focused on bridging artistic integrity and social vigilance. He is a part of the iLL-Literacy arts collective, which creates music and media to strengthen Black and Asian American coalitions; is creative director of Bombshelltoe, which works with artists to highlight marginalized communities affected by nuclear issues; and collaborates with dozens of artists and organizations through his curate and design engine, Phenomenoun. Adriel is the Curator of Digital and Emerging Practice at the Smithsonian Asian Pacific American Center, where he advocates for under-served communities to be treated and represented equitably by museums and institutions. He and his team has been curating Culture Labs — an alternative to museum exhibitions, built on community-centered beliefs. Adriel has recently curated shows at the Smithsonian Arts & Industries Building in Washington, D.C., the Asian Arts Initiative in Philadelphia, and an abandoned supermarket in Honolulu. His writing has appeared in Poetry Magazine, the Asian American Literary Review, and Smithsonian Magazine. He has spoken at the Tate Modern, Yale University, the National Museum of African American History and Culture, and the China Academy of Fine Arts. His performance venues include the Brooklyn Academy of Music, SXSW, the John F. Kennedy Center, and the American University of Paris. He has a degree in human sciences from UC Davis in Community and Regional Development, with a focus on ethnic studies. Adriel is based in Washington D.C., has lived in New York and Beijing, but has never forgotten his roots in the California Bay Area. Watch him struggle to ween himself off Instagram as @DRZZL. Vera Mey commenced PhD studies at SOAS in 2016. Prior to this, she spent several years working as a contemporary art curator in institutions including ST PAUL St Gallery, AUT University, New Zealand and the NTU Centre for Contemporary Art, a contemporary art research centre in Singapore led by Prof. Ute Meta Bauer. More recent independent work has included co-curating and curating exhibitions in New Zealand, Bangkok, Paris, Phnom Penh, Shanghai, Singapore, and Tokyo including in 2017, “SUNSHOWER: Contemporary art from Southeast Asia 1980s to now” at the Mori Art Museum and National Art Centre Tokyo which was the largest survey of Southeast Asian artists to be exhibited, working in a team led by Mami Kataoka. In 2015-16 she was a scholar on Ambitious Alignments: New Histories of Southeast Asian Art, a research initiative of the Getty Foundation. She is co-founder of the peer reviewed journal SOUTHEAST OF NOW: Directions in Contemporary and Modern Art in Asia published by NUS Press (Singapore). Cường Phạm is is a London-based researcher, community activist, and writer. He recently finished a Master’s in Southeast Asia studies at SOAS, where his thesis explored the Vietnamese diasporic experience through hip-hop. He is also actively involved in the local East & Southeast Asian communities in London, working with Hackney Chinese Community Services and An Viet Foundation. Through his work at the grassroots, he has co-curated ‘Record, Retrieve, Reactivate’ which explored history of the Southeast Asian community centred around the An Viet Foundation. Cường is also the co-founder of Indigo Magazine, a platform for news voices Southeast Asia and beyond. In his spare time Cường likes to hunt down old vinyl, concentrating mainly sounds from Saigon, from early 1960s to 1975, which he slowly digitises. Quek Jia Qi (b. 1996, Singapore) is a socially-engaged artist based in London. She works across multiple disciplines, with social practice at its core – deeply intertwined in participation, conversations, critical pedagogy and public practice. Jia Qi has exhibited public installations and worked with communities to activate public experiments. In 2017, she led Shifting Concretes, a public workshop series co-hosted with The Substation as part of the 2017 Discipline the City programme, which culminated in a public art social intervention, “Shifting Concretes: Can we ‘Lepak’better at Orchard Road?” held at Orchard Road, to re-imagine the urban spaces we live in. Expanding on experimental collaborative practices, her recent projects include organising interdisciplinary symposium, Conversations in Singapore History 2018 and And Everything in Between. Jia Qi’s works have also been shown in international venues such as the Institute of Contemporary Arts (Singapore), Capitol Piazza (Singapore), WHITECONCEPTS Gallery (Berlin), Black & White Building (London), and 5th Base Gallery (London). In 2017, she is the winner of the Social Art Award (2nd Place) for her social interventionist art, and selected international artist to exhibit in Germany by The Institute for Art and Innovation e.V.. The work is also published in the award book: The Social Art Award 2017 – Invigorating the Rise of Social Art. Currently, the artist pursues Fine Art and History of Art at Goldsmiths, University of London.